When Meb Keflezighi won the New York City Marathon in 2009—the first American to do so in 27 years—some critics questioned whether the Eritrean-born runner was “really” an American despite his citizenship status and representing the USA on two Olympic and several World Championship teams. Yet Meb is the living embodiment of the American dream. His family came to the U.S. to escape from a life of poverty and a violent war with Ethiopia; Meb was 12 at the time, spoke no English, and had never raced a mile. Yet he became an A student and a high school state and national champion. And when he stood on the platform as a silver medalist in the 2004 Olympics, Meb knew his hard work and determination had paid off. How could life be any better? Then it all came crashing down. Meb, a favorite for the Beijing Olympics, fractured his pelvis during the trials and was left literally crawling. His close friend and fellow marathoner suffered a cardiac arrest at the trials and died that same day. Devastated, Meb was about to learn whether his faith in God, the values his parents had taught him, and his belief that he was born to run were enough to see him through. 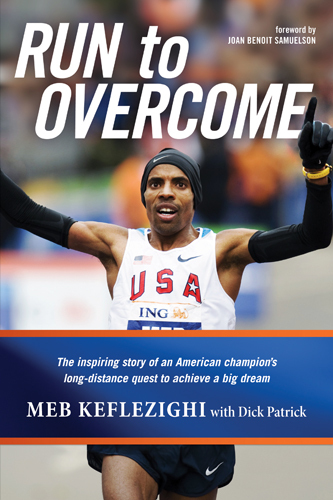 Run to Overcome tells the inspirational story of a man who discovered the real meaning of victory, and who embodies the American spirit of overcoming the odds. My new book is releasing November 2010. Feel free to leave comments and browse through my blog!